I interrupt this all-Fringe-all-the-time coverage to bring you news of Theater Mu's world premiere play The Korean Drama Addict's Guide to Losing Your Virginity, which opened last night. During Fringe. But the good news is they kindly let me attend a preview, and the run extends past Fringe you you still have time to check it out. A romantic comedy about a rich Asian man and a hard-working Asian American woman featuring an all Asian cast. No, I'm not talking about the soon-to-be smash hit movie Crazy Rich Asians, I'm talking about a world premiere new play written by a local Hmong playwright and featuring a charming 10-person local cast. Theater Mu's The Korean Drama Addict's Guide to Losing Your Virginity, written by May Lee-Yang, is a sweet, funny, fantastical story about love, friendship, and the melodrama of life. Like Jane the Virgin does with telenovelas, Korean Drama Addict loving pokes fun at the genre of "K-drama" while also employing the storytelling forms of the genre. I've never watched K-dramas but I am quite familiar with the American soap opera, and they're all variations on the same themes of romance, drama, and fantastical storylines. Our heroine is Gao Hlee, a young Hmong Minnesotan woman who works as a life coach. Her new client is wealthy Korean businessman Benedict, or President Song to you. He's very traditional and firmly believes in the class system, treating his assistant as an underling even though they used to be friends and equals. The initial culture clash between Gao Hlee and Benedict lessons as she teaches him about American ways, and he shares his love of karaoke and long ago dreams of joining a boy band. Gao Hlee is approaching 30 (which is hard to believe since her portrayer Dexieng Yang, although charming and extremely likeable, is a college student and looks more 20 than 30), and is determined to lose her virginity and have babies before that happens. The reason for this hard and fast deadline of age 30 is a little confusing when it comes out, and has to do with Gao Hlee's visions of ghosts, which is also a little unclear. The story is told with brief break-outs of dramatic K-drama scenes which are super fun, and they could even go further in that direction. As a new play it could benefit from one more round of edits, and it also feels a little long at 2.5+ hours with intermission. But it's definitely a fun concept with many entertaining moments. I also wanted more singing, but maybe that's because I can never get enough of Katie Bradley (in a dual as a gross American and Benedict's mother), and Brian Kim as Benedict has a surprisingly (because of the stern character) great voice. In addition to the above mentioned talents, the cast also includes Clay Man Soo as Benedict's assistant, Khadija Siddiqui as Gao Hlee's best friend Z, and an intrepid ensemble (including Phasoua Vang, Joann Oudekerk, Gregory Yang, Yeej Moua, and Mai See Lee) playing multiple characters. Under director Randy Reyes the cast really gels and jumps in with both feet into the world of the K-drama, including some slow-mo movement and melodramatic scenes. 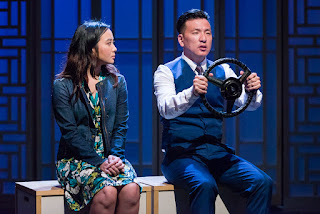 Despite a few issues that could be worked on or clarified, The Korean Drama Addict's Guide to Losing Your Virginity is an entertaining play that invites the audience into the world of Korean dramas and Hmong culture. It's largely about the stories we tell and the stories we crave, stories of happy endings and love overcoming all odds. And that's something we can all relate to. The Korean Drama Addict's Guide to Losing Your Virginity continues through August 19 at Park Square Theatre.